Bruno is relishing the pressure of helping Brighton return to winning ways. The Seagulls are without a win in seven Premier League games after Saturday's 0-0 draw with Burnley. 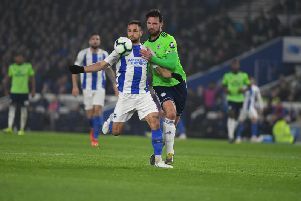 Albion's captain admits having pressure is good because it shows the players care and he also feels a win against Watford on Saturday and heading into Christmas with 21 points will be an excellent return. He said: "If you had asked me when we started the season, 18 points before Christmas is quite good. "If we win our next game on Saturday, it's 21 points and that's a good number but our performances recently weren't the best ones. "We haven't won for a few games, so of course we've got pressure and it's good to have that pressure because that means you care." Asked whether the draw with Burnley was a point gained or two lost, Bruno said: "If you'd asked me that after the first half, I would say we lost two points.
" After the whole game, maybe we lost two points but there was a period they had a really clear chance that can change the game. They've been winning games 1-0 at home and away and it's really tough to play against them. "First half, we were much better than them. We had a lot of chances and we were waiting to score that goal that would have released the pressure we've got right now. "But we didn't and in the second half they were much better and had chances but at the end we know how tough it is to play against them. They are on a really good run and it was a tough game." Bruno backed striker Glenn Murray, who blazed a penalty over the bar, and said: "Today was so unlucky, the pitch has not been in the best condition and doesn't help us but Glenn has got experience to get through this period." Bruno also praised keeper Mathew Ryan, who made an excellent second half save to deny Chris Wood after the Burnley striker got through one-on-one: "He's on form, he's been very good and today he made a couple of good saves. We need that and need the best out of all of our players."